When he saw an article about five years ago called Moneyball for Law Departments that promoted the application of that methodology to the management of law departments, it sparked his focus on legal operations. Still senior legal counsel, commercial transactions at Bombardier at the time, Denis started a personal project researching the area and then persuaded the company’s management to formally launch a legal operations function, which he led as senior legal counsel, legal operations and litigation since its creation in 2014 until coming onboard with SNC-Lavalin in March of this year. Denis, whose current role consists of managing the department’s strategic plan, budget and outsourcing strategies as well as finding ways to better enable the corporation’s legal counsel through the addition of new technologies and processes improvement, says he’s noticed a lot of legal ops people are not lawyers — large corporations have moved to procurement-background types for the job, which he calls unfortunate. 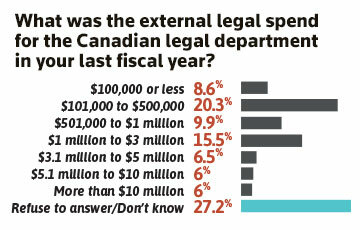 Legal department management and structure/moving to legal operations was a pretty big concern for the 232 respondents to Canadian Lawyer’s Annual Corporate Counsel Survey as well — it ranked second overall as a key issue in respondents’ legal departments, coming in just behind cybersecurity. When asked if the general counsel has the autonomy to select firms with which the company works, a little less than 70 per cent — 67.6 — said yes, which more or less holds steady from the last survey at 68.5 per cent. But Denis points out that means that more than 30 per cent either don’t decide or share the responsibility with other people. While it may not necessarily be a bad thing that upper management is deciding on firms, Denis thinks it should be the legal department’s prerogative and counts himself lucky that in his working experience legal has strong equity with the rest of the business and, therefore, a good level of autonomy. But Denis — who is also president of the Association of Corporate Counsel, Quebec chapter and a member of the Quebec bar’s liaison committee with corporate counsel — notes that this is a privilege and not a right. He points to question 9 of the survey, which asked if external spend changed and if so, why? Underlying that question is a bigger, more important one: Is your budget under control? Can you efficiently forecast? Do you measure it? Denis says lawyers need to be cautious here because businesses — including his own — are going to ask for cost predictability. For 51 per cent of respondents, external spend went up because an isolated/one-off situation led to higher fees, slightly higher than the 47.8 per cent giving that same reason last year. Jonathan Cullen, vice president, legal affairs and general counsel at Pfizer Canada Inc. in Montreal, says the number “seems high to the point where it requires reflection. Denis agrees, noting the same excuses — “we don’t know how many times we’re going to get sued, it’s out of our hands” — don’t work anymore. Nick Slonosky, new chairman of the Canadian Corporate Counsel Association and director and legal counsel with Investors Group in Winnipeg, found it unsurprising that cybersecurity ranked first as an issue of concern. “If that wasn’t top of mind for every in-house counsel in Canada, I don’t know what would be — they wouldn’t be doing their job,” he says. Cullen says at his organization “it is absolutely in the top identified risks in our enterprise risk management framework. Cullen says he pays very close attention to law firms — they are vendors that “contain a lot of highly confidential information that’s very valuable to a bunch of rich clients and can be leveraged in extortions,” and even high-quality protection systems are not infallible. The Hospital for Sick Children, says privacy is a “key consideration” for organizations today, both in terms of compliance with evolved privacy laws such as PIPEDA and PHIPA and data security. “In my role, I am constantly monitoring privacy incidents in our industry and re-assessing our privacy compliance framework to ensure it continues to be effective at preventing privacy incidents from occurring and keeping the hospital prepared should an incident occur,” Lawrence says. Today, almost all organizations need to deal with some level of personal information in their operations, she notes, which means privacy protection is essential to doing business. Cullen says his company works hard to make sure it has proper breach response processes. 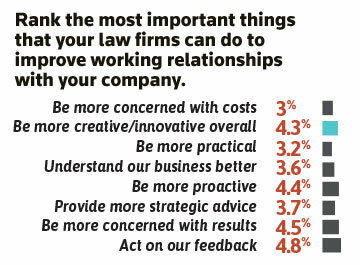 Holding steady from past years, litigation tops the list of work most commonly sent outside. At 78.4 per cent this year, it’s up from last year’s 72.2 per cent, followed by employment/labour (54.3 per cent), mergers and acquisitions (28.1 per cent), intellectual property (27.1 per cent) and tax and regulatory matters (both at 26.6 per cent). Denis says litigation is typically happening after the fact. One of his biggest challenges is how to leverage the law firm relationship — “pretty much building deeper supplier relationships,” he says. Denis says some firms are getting good at leveraging AI and analytics to better understand trends legal departments are seeing in terms of lawsuits and having a discussion on how to predict and prevent adverse effects, for example. “That’s really what keeps me up at night — how do we go beyond just spending and being a cost centre?” he says. While some respondents were succinct with their reasons for going with certain firms — “I choose lawyers that are reasonable, practical and do not bill me to death with time/billings,” said one — 68.3 per cent of those who took the survey said they choose firms based on specific lawyers, up by 2.7 per cent over last year. While Cullen says he’s not surprised in-house counsel choose based on individuals — after all, “you don’t hire a company or a firm, you’re hiring people you work with, human beings” — for him, it’s more about building a long-term relationship with a firm as a whole. But he notes that if you are a client of sufficient influence, you can ensure a particular partner or associate is getting good work and is involved in strategic discussions. “I put my own skin in the game to ensure to [the] best of abilities they’re happy with what they’re doing — I continue to provide good opportunities,” Cullen says. For Denis, too, it’s more about the firm as a whole. He looks for innovation above all else, noting that while all firms might say they’re innovative, he checks things such as if e-discovery is done the old-fashioned way or whether they have the capacity to leverage AI and predictive coding. “I’d rather focus on a firm’s capacity in terms of efficiency, productivity and innovation — real innovation,” he says. Carrying over from the last few years is a decline in the use of alternative fee arrangements — 3.2 per cent said AFAs were the billing arrangement they had with their primary law firm/external service provider, which was a slight drop from 4.9 per cent last year and a considerable drop from 12.7 per cent in 2015. The billable hour came out on top again, with 50.5 per cent — essentially unchanged from 2016 and up from 46.8 per cent the year before. 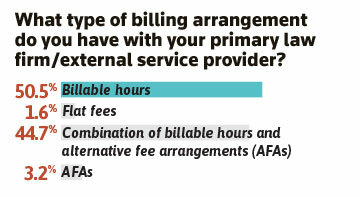 The combination of billable hours and AFAs was second with 44.7 per cent. “The discussion is amongst all circles — that conversation is continuing,” says Slonosky, noting that looking for counsel who truly understand business issues is more important than how services are provided. 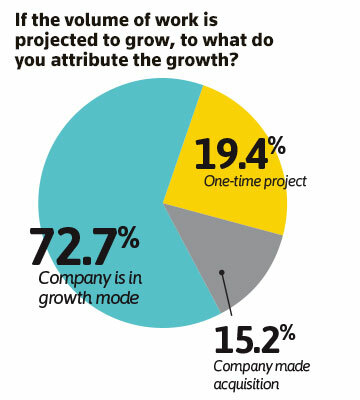 When asked if they were interested in engaging firms in AFAs, 77.4 per cent of respondents said yes. Cullen says the disconnect between the overwhelming desire for AFAs versus those who say they’re actually using them stood out to him. The Pfizer Legal Alliance, a group of around 15 law firms globally, makes use of flat-fee structures based on anticipated work for the year, but the main drive is long-term value creation. Denis says “we sign 15,000 engineering services contracts every year — it’s a given we’re going to be sued” — but they’re similar suits, so he’s trying to isolate tasks that can be grouped together and price them reliably. In question 25, respondents said one of the top things a firm can do to improve working relationships with their company was be more proactive, and in a highly regulated industry such as pharmaceuticals, Cullen appreciates a heads up to regulatory changes or new legislation that might impact his business. “Bad is receiving nothing, good is getting periodic updates that are relevant to my industry and company, but all the way at the other end of the spectrum at great is customization for my organization,” Cullen says. Decisions at Pfizer are complicated, and they’re rarely based on dollars alone — it’s about people’s lives. Cullen says he likes outside counsel to see what they struggle with. Slonosky identifies diversity as another way firms could improve, saying he’d like to see the results of question 23 — do you ask firms you do business with to provide a diverse roster of lawyers to work with? — reversed. Less than 20 per cent — 17.8 — ask, and the vast majority — 70 per cent — don’t. Another 12.2 per cent of respondents indicated they were thinking about it. But in the followup question, 71.4 per cent said firms are happy to provide a diverse roster if asked. “We’re not asking the right questions sometimes, that’s what that tells me,” Slonosky says. “Pfizer as a whole is alive to the issue,” Cullen says, adding that companies have leverage with their firms and that’s how things change — when customers, clients and users of services demand it. More than 80 per cent — 84.4, compared to 87.8 per cent last year — of respondents reported firms don’t request feedback. Cullen says that’s a missed opportunity, and in-house counsel could say proactively, I’m willing to invest my time. Last year, Cullen offered to meet with a firm and they flew out from Calgary. Denis says his company also has very “deep-dive reviews” twice a year with the firms that get most of its volume. Click here for a pdf of the complete survey.